We arrived in Sydney with rough seas through the night. It was cloudy in the morning but the sun prevailed and it turned out to be a beautiful day in Sydney with temperatures around 70 degrees. We took the ship’s shuttle bus from White Bay Cruise Terminal to Darling Harbor’s Sea Life Aquarium where we set out on foot towards Bangaroo Reserve. 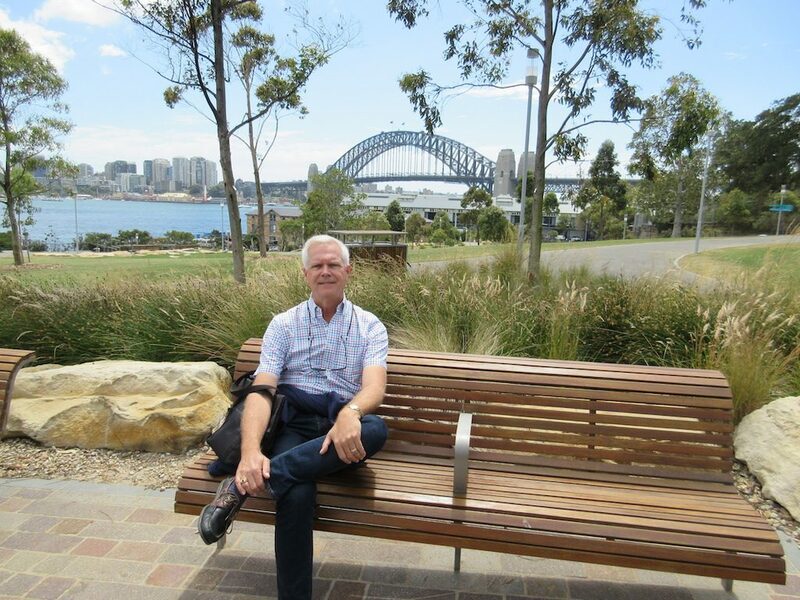 From Bangaroo Reserve you get great views out over Sydney Harbor and you can see the iconic Sydney Bridge. We continued our walk along Walsh Bay to Dawes Point where we walked under the Sydney bridge and suddenly the Sydney Opera House comes into clear view. We continued along the waterfront through The Rocks neighborhood towards Circular Quay. Once at Circular Quay we purchased ferry tickets to take us to the town of Parramatta at the furthest point up the Parramatta River (14 miles). The ferry trip took about 90-minutes making stops at several towns along the way. The river is extremely wide in some places and most of the shoreline is developed with all sorts of housing. You see everything from large estate parcels with mansions on them to apartments and condominium buildings. At one point you see a campground complete with army green tents where you just need to show up and you can camp along the river. Along the river banks there are many parks and paved pathways for walking, biking and jogging. Once we arrived in Parramatta we found a restaurant along the bank of the river where we enjoyed a lunch of fish and chips for 10 Australian dollars. Just outside the restaurant was a free shuttle around the shopping district of Parramatta, so we took a twenty-minute ride on the free shuttle to see the town. Parramatta with a population of about 26,000 was founded by the British in 1788, the same year as Sydney. It has a multicultural population with about 30% of the residents being born in India, 12% in China and 24% in Australia. 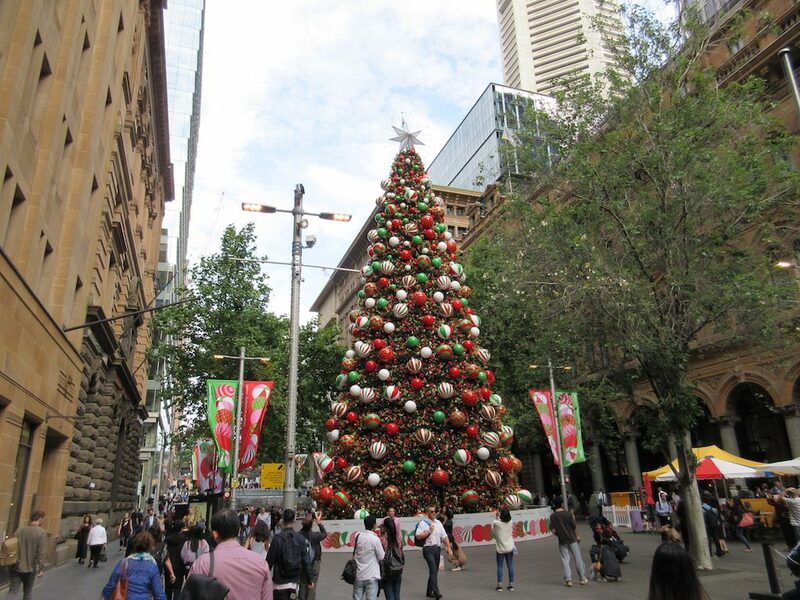 After returning to the circular quay in Sydney we walked along George Street, famous for shopping. The streets were filled with folks getting off from work as well as shopping. George Street is undergoing renovations as they upgrade their public transit system. The shops and malls were filled with holiday decorations. Upon returning to the ship we found that about 130 passengers had disembarked the ship and were headed home while about 40 new passengers would be boarding for our final leg across the Pacific to Los Angeles. We met a very nice couple who were from Canada (Andrea and Christopher) who had been traveling for the last year all around the world. 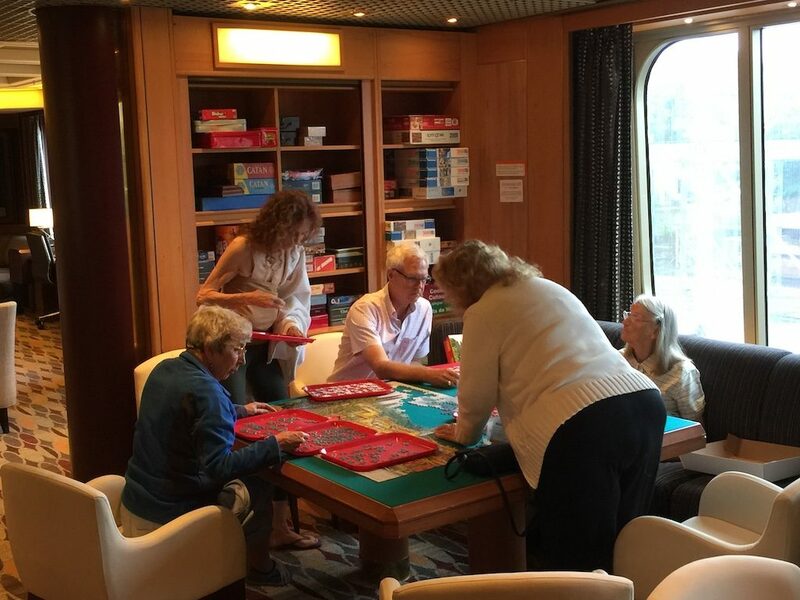 This was their first cruise ship experience and so they had some questions about what to expect on a ship and we were happy to speak with them. The weather had improved dramatically since we left Asia. The temperatures were considerably cooler and there was much less humidity. Although the seas appeared calm when we arrived in Mooloolaba (moo-Lool-a-ba), the captain cut our visit short by two hours due to expected afternoon swells. Our call in Mooloolaba was a tender port, meaning that we anchored out in the ocean and took smaller tender boats from the ship to shore. This also meant that several of the ship’s shore excursions were cancelled due to the shortened day in port. All aboard was 2:30pm with a 3:00 sailing time. Mooloolaba is a suburb and tourist resort town located on the Sunshine Coast of Queensland, Australia. It is about 60-miles north of Brisbane with a population of only about 8,000 inhabitants. The area has many man-made canals with homes built on them, each with their own boat dock. Many of the homes are new and the architecture is quite modern in style. Mooloolaba derives its name from the Aboriginal word mulu meaing Snapper Fish, or mulla meaning Red Bellied Black Snake. Originally known as Mooloolah Heads, the name was changed to Mooloolaba by Thomas O’Conner in 1919 when he subdivided the land for sale. The dock where the tender boats dropped us off is located in a beautiful canal area with many shops, an underwater world marine park, souvenir shops, galleries and restaurants. The white sand beaches are expansive and filled with tourists enjoying swimming, boating, sailing, kayaking and sunbathing. The town was very neatly manicured and well maintained. 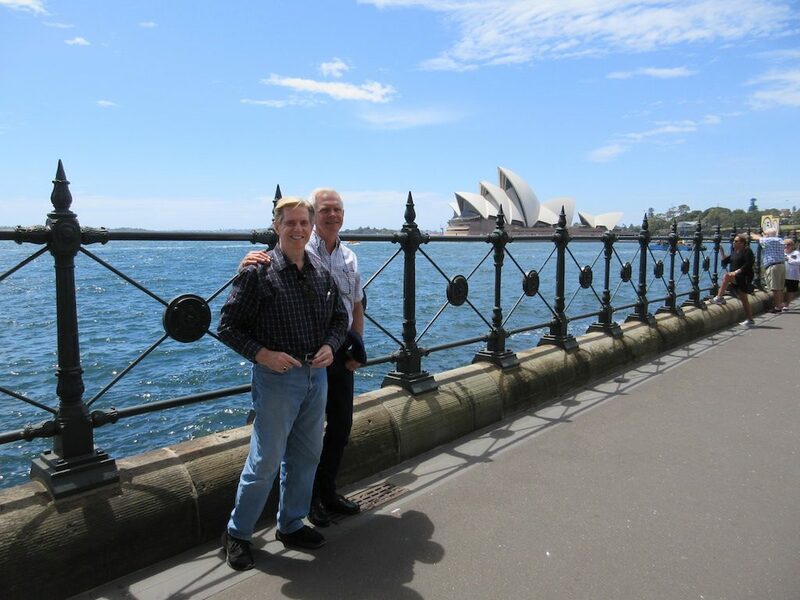 Friends, Greg and Tony who used to live in Sydney, had moved to a town near Mooloolaba about eight months ago. They were kind enough to pick us up at the pier and drive us to their new home for a visit and lunch. They are retired flight attendants from Qantas Airlines whom Kent met (Greg) back in 1976. At their home were a couple of other retired flight attendants from Qantas who live on the gold coast about 90 minutes south of Mooloolaba. We had a wonderful, although all too short of a visit with them including a delightful lunch of pasta with prawns. They returned us to the pier in time to board the ship for our onward journey to Sydney. The sea swells had increased and the tender ride was a bit rocky but all made it safely back onboard the ship. Brian joined us again for dinner. The evening’s entertainment was a second performance by the group from London called Graffiti Classics. The fourth member of their group was able to arrive onboard and performed with them. They had another energetic, entertaining and funny show of classical music and comedy. This sea day was filled with more lectures. Jorge’s coffee chat was with Reef Pilot, Captain Hulsebos. Following the morning show, Ian discussed things to see and do to make the most of our time in Mooloolaba, Australia. Mark attended a Pearls seminar to support Jon and Brian, the pearl sellers onboard. They were having a pearl seminar but were having a difficult time getting people to come to the seminar. In the end there were only six of us who attended the talk on pearls. In the seminar Brian talked about the types of pearls, color of different pearls, the care of pearls, size of the pearls as well as pearls worn by famous people in history. 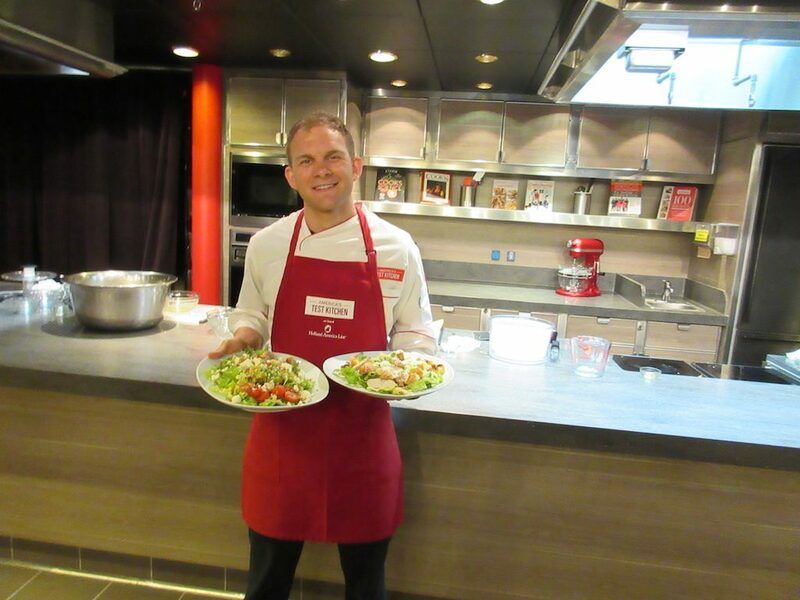 Mark attended a cooking class with Spencer about Getting to Know Chilis where he learned about a variety of chilis used in cooking. Meanwhile, Kent attended a talk with the Amsterdam cast of singers and dancers and the production staff where he enjoyed the backstage tour (again) and chatting with the stars! In the afternoon there was a lecture by Tim Runyun about the Pacific Origins of the Smithsonian. Following that was a lecture by Mark Lax on the Story of Coffee. The LGBTQ group has been meeting in the Crow’s Nest bar at 5:00pm each day when we are not still in a port. The group is fairly small with only four or five people attending regularly. However, we enjoy sharing stories about our day. Brian, the Mentalist, joined us again for dinner in the dining room where we shared a table with Henry and David from Seattle not far from where Brian lives. The evening’s entertainment was a guitarist by the name of Jesse Kazemek who performed a Tribute to the Beatles. Jesse’s father introduced him to a Beatles album when he was very young and it projected his life’s path of learning and performing the more than 200 songs that the Beatles recorded. His wife also joined him on stage for a few songs. This was the first of two sea days as we traveled to Mooloolaba, Australia. They hosted a special brunch in the dining room with a tasting menu. It was a set menu where they served coffee, muffins and orange juice followed by a plate of about six cold appetizers. This was followed by a plate of about six hot breakfast items followed by three desserts. Way too much to eat but nice to be able to try a variety of things. Cruise director Jorge interviewed the guest performers called Graffiti Classics. When they performed a few nights earlier, they were missing one of their four members but she had now arrived onboard for the next show. Similar to a girl’s group that had performed onboard earlier, they are four members of a group of 16 contract workers who can perform the same shows. This allows all of them to be able to take other work when opportunities arise… like a Broadway or West End show. Guest speaker Tim Runyan gave a lecture titled, “It was a Dark and Stormy Night.” The lecture covered five stories about sailing vessels in history and their captains, including the Titanic. This was followed by a lecture with Mark Lax titled, “Sir Joseph Banks-Amazing Florilegium.” Joseph Banks and Daniel Solander, while accompanying Captain James Cook on his voyage around the world between 1768 and 1771, collected plants from Brazil, Madeira, Tierra del Fuego, the Society Islands, New Zealand, Australia and Java. Banks and Solander collected nearly 30,000 dried specimens leading to 110 new genera and 1,300 new species, increasing the known flora of the world by 25%. Along with Banks and Solander was a botanical illustrator by the name of Sydney Parkinson who made 674 detailed drawings of each specimen with notes on their color. When they returned to London in 1771, five artists completed 269 watercolors of Parkinson’s drawings. 18 engravers created 743 copperplate line engravings from the watercolors at considerable cost. Banks’ book was never completed during his lifetime and on his death, he bequeathed the plates to the British Museum. It was not until the 1980’s when most of these plates were brought out of the basement and finally printed. In the afternoon the Australian Cultural Ambassadors gave a performance of the didgeridoo, the clap sticks, singing and dancing. Many of the pieces sounded very similar and it was difficult to differentiate one dance from another. For dinner we invited mentalist, Brian Ledbetter, to join us in the dining room. We had a nice dinner getting to know Brian better and learning more about his business and of his entertainment lifestyle. He is from the Seattle area and performs for corporate events, parties, on cruise ships and more. The evening’s entertainment was a comedian from Australia by the name of Darren Sanders. He has been performing comedy all over the world for over 25 years. He was ok but did not blow our socks off. Cairns (pronounced Cans) is located near the northeast corner of Australia in the Queensland region and has a population of about 150,000 inhabitants. Cairns is an extremely popular tourist destination because of its tropical climate and the access to the Great Barrier Reef, considered one of the seven natural wonders of the world. The area around Cairns is used for the cultivation of sugar cane. Prior to British settlement, the Cairns area was inhabited by the Gimuy Walubara Yidinji native people, who still claim their rights to the land. The natives call the area Gimuy in their native language. In 1770, James Cook mapped the future of Cairns, naming it Trinity Bay. Several expeditions later established its potential as a future port. By 1876 Cairns was founded, hastened by the need to export gold discovered on the tablelands to the west of the inlet. The mangrove swamps were cleared and sand ridges were filled with dried mud, sawdust from the local saw mills and ballast from a quarry. During World War II, the allied forces used Cairns as a staging base for operations in the Pacific. The US Army, Air Forces and the US Navy had a presence here. 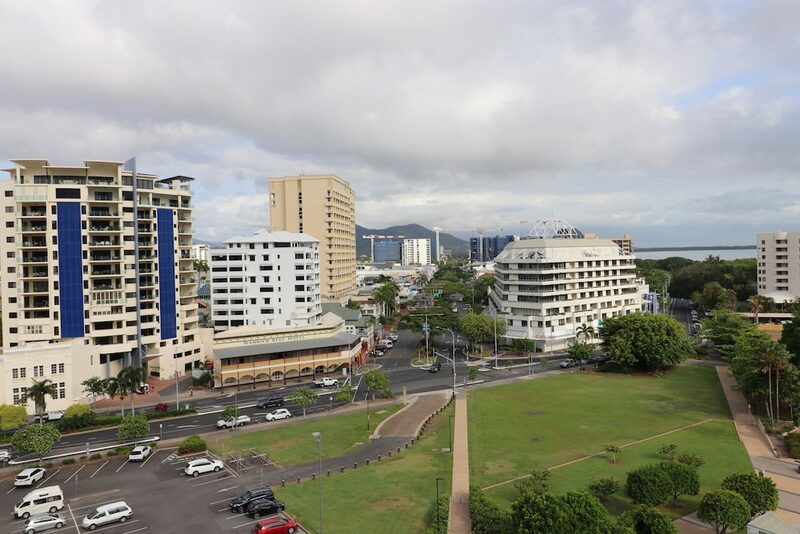 It was not until 1984 that the Cairns International Airport was opened and helped establish the city as a desirable international tourism spot. Kent had been to the area in the 1970’s but this was Mark’s first visit to the Great Barrier Reef. 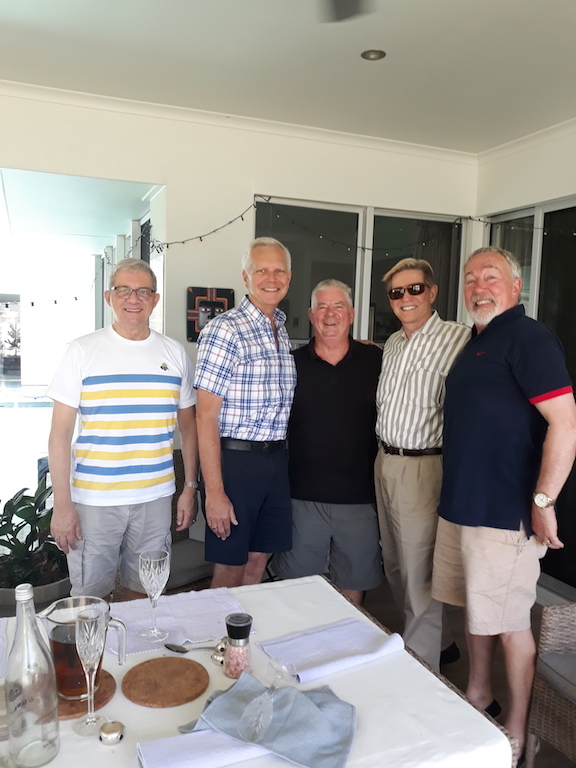 Therefore, Mark chose a tour to the Great Barrier Reef while Kent took a scenic walking tour of Cairns’ Botanical Gardens with our neighbors from San Diego Ana Maria and Sandy. A volunteer there gave an historical out of the gardens. After lunch, Kent went into town to get a watch battery and have a look at the big seaside pool. 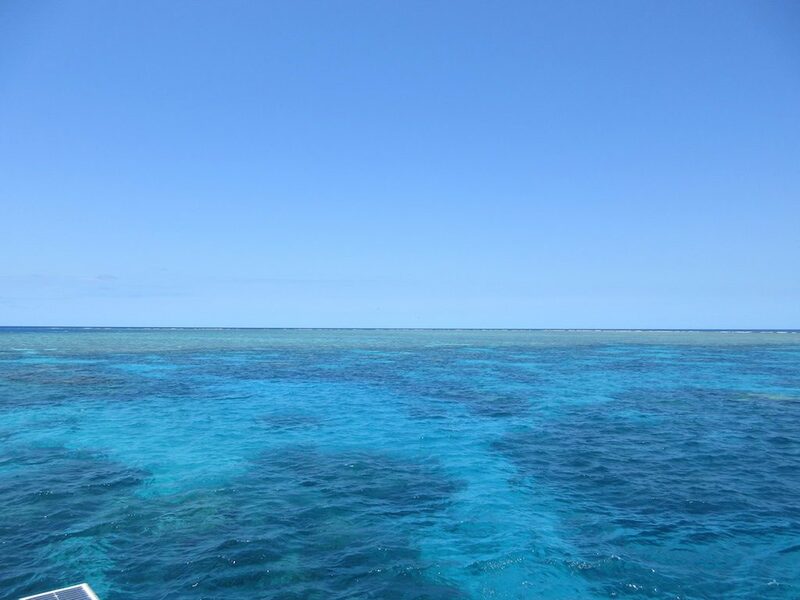 Mark boarded a high-speed catamaran for a 90-minute ride until he arrived at a mooring on the outer Great Barrier Reef. A UNESCO World Heritage Site, the reef is considered to be one of the Seven Natural Wonders of the World. The many reefs and atolls that make up the reef are rich with coral, fish, mollusks, and visiting sharks, dolphins, and turtles. 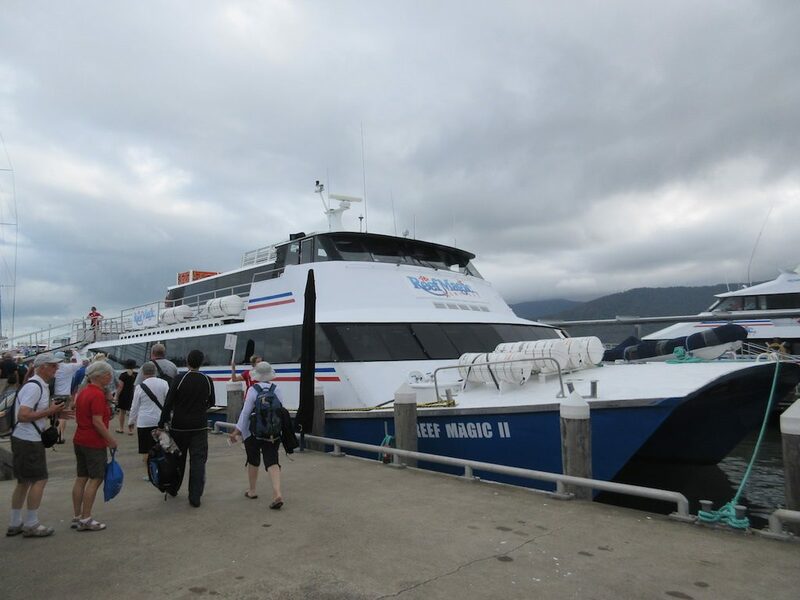 The catamaran was on two levels and had seats for around three hundred people. Luckily HAL had chartered the ship for the day just for its guests and there were only 62 of us onboard with plenty of room to get around. Some folks chose not to go snorkeling or scuba diving and took a tour of the reef in a small four-person glass bottom boat. A presentation by a marine naturalist on board our catamaran prepared us for the exquisitely beautiful underwater world that lied ahead. 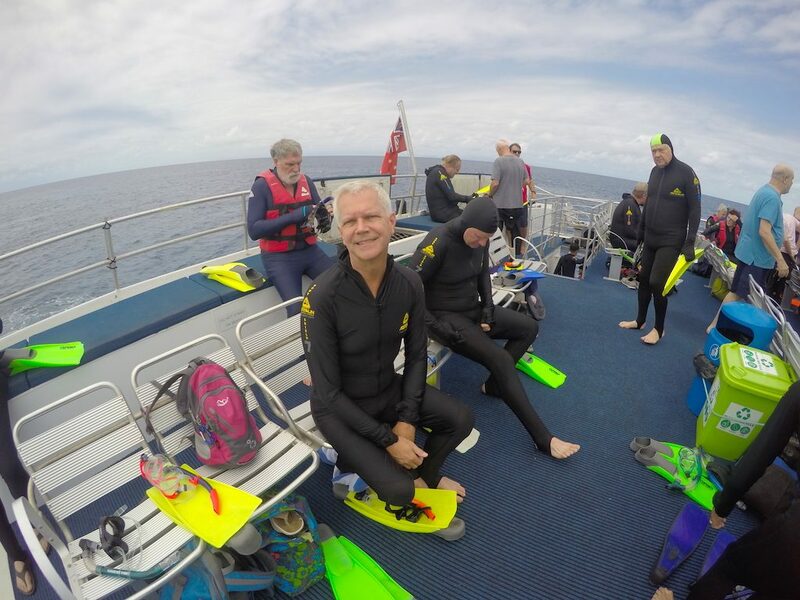 We donned our snorkel equipment (including a nylon form fitting onesie to protect us from the jelly fish, life jacket, fins, snorkel and mask) and jumped into the water for an active Barrier Reef experience with plenty of time to swim and snorkel in the Outer Reef environment. We saw many colorful tropical fish and the intricate coral gardens in all shapes and sizes. 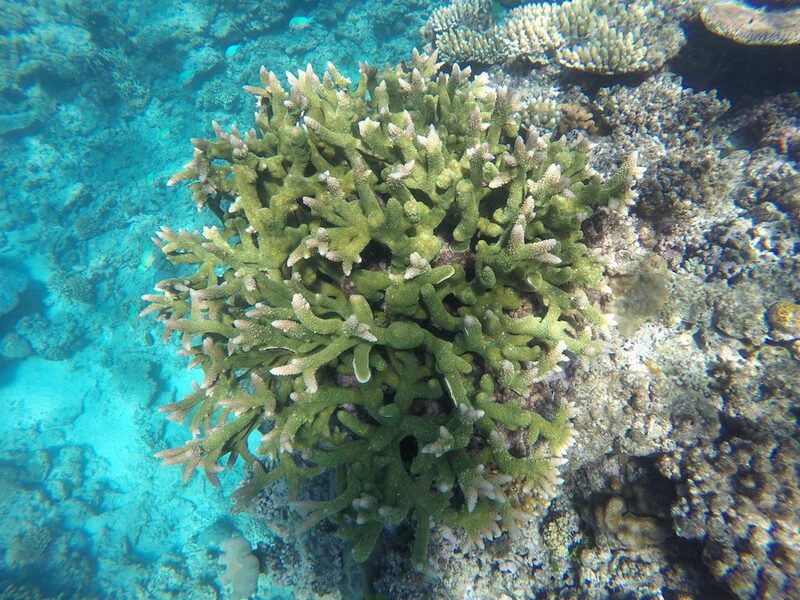 The colors of the reefs were mostly light shades of whites and beiges but mixed in were very colorful purples, yellows and greens. The living reef has all sorts of unusual shapes of life with many fish swimming in and around the coral. There were lots of large cucumber looking snails. The water was crystal clear, making it appear as if you were just a few feet above the coral reef and in some cases, you were. We had no sightings of sharks, jelly fish or anything scary— so that was good. After our morning snorkeling experience, we enjoyed a buffet lunch served aboard the vessel. While we were having our lunch, the ship’s crew changed locations to another reef where the current was not as strong so that it was not as difficult to stay near the ship. In total we spent about five hours at the reef before returning to land. Kent’s walking tour gave him a great background on the city of Cairns. Only 140 years old, it was first settled by Europeans during the gold rush. Irish, English, French, Danish, Italian and Chinese fortune hunters braved the crocodile-infested waters, the dense rain forests, the heavy monsoonal rains, the ‘biteys,’ the stingers and the heat to build what is still the last city on the road going north from Sydney. All sorts of adventurers followed, including escapees and alternative-lifestyle seekers. Prior to European settlement, the Yirrganydji and the Yidinji Aboriginal people walked this land, and their history is an intrinsic part of Cairns’ story. Despite the fun and upmarket array of cafés and shops, Cairns still boasts a touch of the wild, weird, whimsical and wonderful. 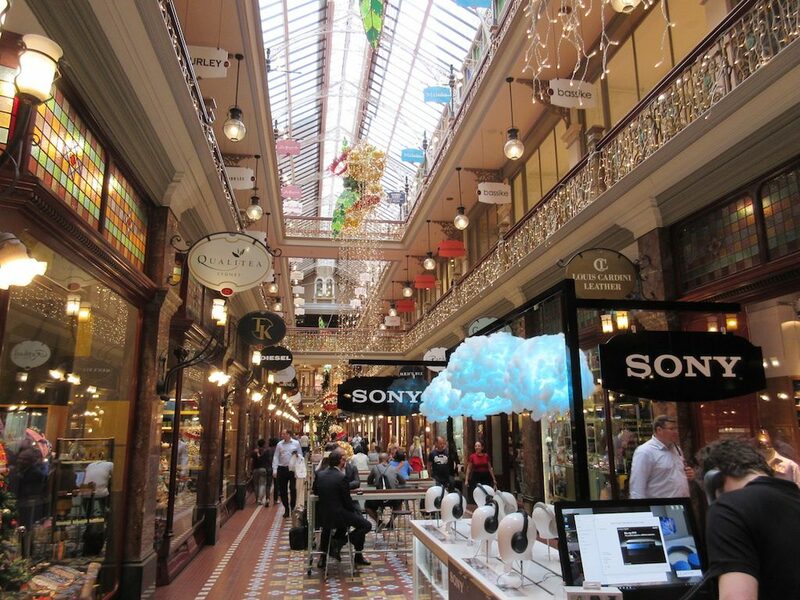 After Mark returned from exploring the great barrier reef, Kent took him into town to see some of what the city had to offer. Kent found a haircut in the night market for $20 and was happy with that. There are many trees all through the city where parakeet colored birds flutter and squawk about. In other trees we found thousands of large bats hanging from the limbs. Back onboard the ship we saw the singers and dancers in a show called Dance which they had performed once before on this voyage, but we enjoyed it nun-the- less. After the show we had our Thanksgiving dinner in the dining room where the crew had decorated with fall colored leaves, pumpkins and gourds. This was our third and final sea day as we traveled from Darwin to Cairns, Australia. Jorge had cellar master Jacques and Pinnacle maitre’d, Tina, as his guests at the morning show. Tina is the one who spotted the life boat drifting in the sea a few weeks ago and reported it to the bridge. Jacques is from South Africa and Tina is from the Philippines. Ian lectured on Making the Most of Our Visit to Cairns and Mark Lax lectured on The Great Barrier Reef-World Natural Wonder. Mark discussed how difficult it is to protect the reef with the change in water temperatures, millions of tourists every year; even sun tan lotion in the water affects the reef. We shared lunch with Andy May, the piano bar pianist. Andy is from Scotland and plays the piano by ear rather than playing from music. He uses a tablet for the words to the songs but he does not need music to play the piano. In the afternoon guest speaker Tim Runyan gave a lecture on Pirates, followed by a lecture on Navigating at Sea presented by Mark Lax. Kent had another appointment with the ship’s acupuncturist and his knee was improving as he was able to walk better without hobbling along. The evening’s entertainment was a vocalist comedian by the name of Johnathan Clark. Johnathan has a good voice which he uses to impersonate a plethora of characters from Donald Trump to famous singers. We had seen him previously but he has added a few new twists to his act since we last saw him.